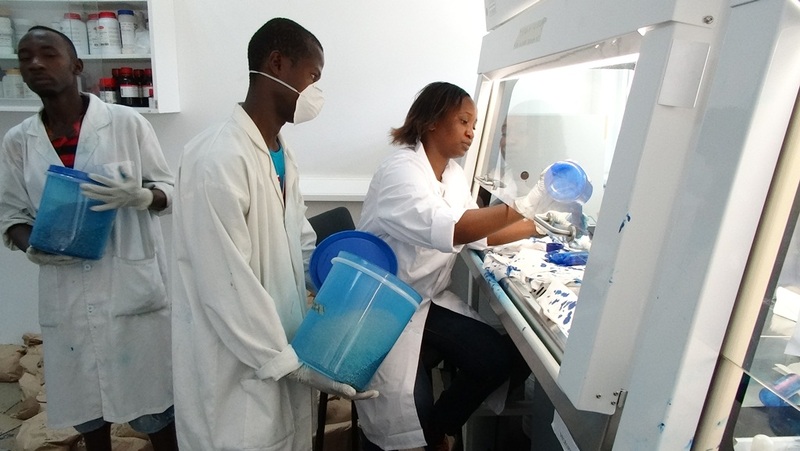 Team at IITA Tanzania preparing the Aflasafe in the laboratory. IITA has produced and dispatched over 10 tons of experimental biological control products (Aflasafe), which will be tested in field trials for their efficacy to reduce aflatoxin contamination in three countries in Eastern and Southern Africa. The production took place at IITA’s research facilities in Tanzania. IITA, in partnership with USDA-ARS and local national institutions, has successfully adapted the biocontrol technology and developed a biocontrol product with the generic name Aflasafe, which reduces aflatoxin contamination of groundnut and maize consistently by >80%. Currently, the product is registered for use in Nigeria and Kenya. The biological control product is made from strains of the mold, Aspergillus flavus, that do not produce aflatoxin. These good strains outcompete and displace aflatoxin-producing strains of Aspergillus, thus reducing aflatoxin contamination of important food security crops like maize. also occur in other countries. For Malawi these were MW02 and MWMZ01—the former was made from strains that are specific to Malawi while the latter was made from region-specific strains. Similarly in Mozambique MZ02 and MWMZ01 were produced and dispatched. In Tanzania, TZ01 made from region-specific strains and TZ02 made from strains that are specific to Tanzania, were produced. The experimental biological control products will be validated for efficacy to control aflatoxin in groundnut and maize. Both crops are staples in the three countries and are also highly susceptible to aflatoxin contamination. The biological control products will be tested this growing season and the data collected will go towards identifying the best formulation to control aflatoxins. After more validation tests the products will be registered and made available for wider use. The atoxigenic strains were identified following rigorous tests and characterization done in IITA’s laboratories in Nigeria and USDA-ARS in Arizona, USA. These isolates lack the genes required for aflatoxin production and therefore will not produce aflatoxin in nature. Each product is made up of four atoxigenic strains that are widely distributed in each country and belong to different classes. stick the spores of the fungus to the sorghum and a dye, a natural food colorant, are added. The final product looks blue (from the blue dye) and is readily distinguished from untreated sorghum. 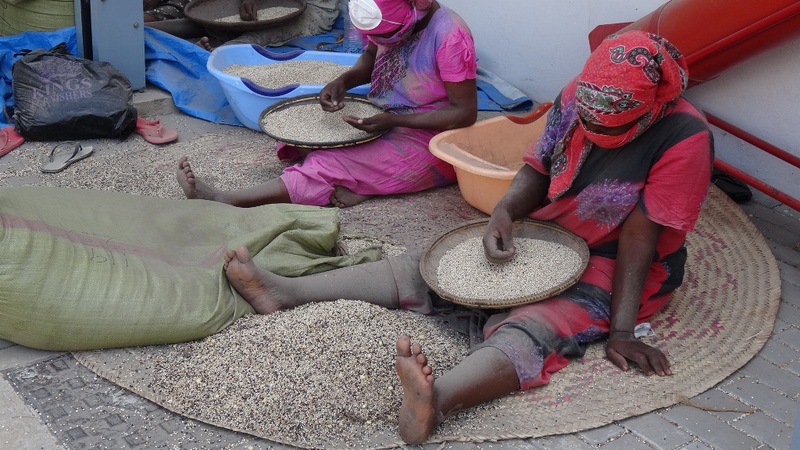 Women sift sorghum that will be roasted and used as a carrier for the aflasafe. “The production of 10 tons of aflasafe was by no means easy as we had to do it manually—it was three weeks of back-breaking work for our staff, partners, and other hired laborers,” said George Mahuku, IITA’s Plant Pathologist, who led the efforts. They also received support from IITA staff in Nigeria where IITA already has a plant to produce Aflasafe. “However, we are very happy and proud of our efforts and the impact it will have in reducing aflatoxins, a major problem in the three countries,” Mahuku added. “It made economic sense to produce the Aflasafe in Tanzania as opposed to Nigeria as the shipping costs would be very high.” They were shipped by road to the two countries.